This half-fold Thanksgiving card would be great for kids, since it features two Pilgrim children and a funny turkey on the front. This Thanksgiving Printable is available to download for free, or you can download the entire collection for only $19.00. The free version is available in PDF format. It can be opened and printed with Adobe Acrobat Reader, or any other program that can display PDF files. Thanksgiving Greeting Cards are also available in Word DOC format for you to download, customize, and print. 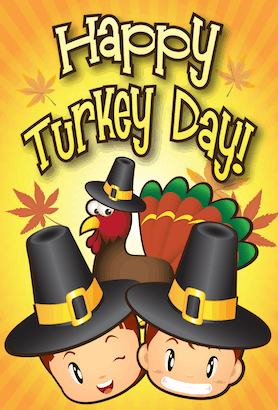 The $19 version includes all of the Thanksgiving Printables on this site, in DOC and PDF formats. After purchase, you can download them and use just a few Thanksgiving Printables or the entire collection. If you don't see a Thanksgiving printable category that you want, please take a moment to let us know what you are looking for.